OXFORD, Miss. – In 2008, Ricky Clayton was in his early 50s, lost in the throes of a life-threatening painkiller addiction and homeless in Memphis. Substance abuse had been with him like a shadow for more than 30 years. In 2005, his brother died alone from a heroin overdose in a Burger King bathroom. Clayton, who was himself hopelessly addicted to dilaudid, a powerful opioid prescription painkiller, also took methadone or heroin, both readily available opioids that helped him avoid the painful symptoms of drug withdrawal when he didn’t have dilaudid. Though the odds were stacked against him, Clayton’s story has a happy ending. 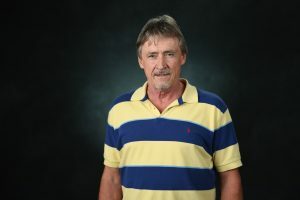 On Saturday (May 14), Clayton, 60, now a clean and sober grandfather, will receive his bachelor’s degree in social work from the University of Mississippi. A U.S. Centers for Disease Control and Prevention study published in January found the yearly rate of U.S. opioid deaths has tripled since 2000. In 2014, drug overdoses accounted for one-and-a-half times more deaths than from car crashes. More than half a million people in the United States have died from overdoses since 2000, with opioid pain relievers and heroin being the main drugs associated with those deaths. All this makes Clayton’s achievement a monumental one. The pride he feels in this milestone is evident when it’s mentioned. “It’s a dream I had when I was young, and I never thought I was going to be able to attain it because of my addiction, but if you stay clean, it goes to show you anything is possible,” Clayton said. “I’m going to be so proud. Clayton’s addiction story began in the 1970s. Pills started as a recreational drug when he was a young man who, like many of his generation, experimented. While he was homeless, the Memphis Union Mission on Poplar Avenue became a haven for Clayton. On cold nights, if he could afford the $6 cost of lodgings, he was able to stay there and get a meal. Downtown churches also feed the homeless. On the streets of Memphis in 2008, he began to take stock of what addiction had done. He’d watched it kill his brother, end his own marriage, cause him to lose his job and lead to him doing a stint in jail. Ultimately, it caused him to not be able to afford a place to live and had left him homeless for a year. He decided to go for his sixth stint in rehab. He was determined to do whatever it took to get better. Addiction counselors at Haven House in Oxford urged him to begin college classes at Northwest Community College and follow the dream of earning a diploma that he’d abandoned years ago when drugs overtook his life. He worked at Haven House and studied at Northwest, then came to Ole Miss. While studying here, he’s leaned heavily on UM’s Collegiate Recovery Community, which offers a community of support for recovering students to help them achieve academic goals. The comfort he’s found with the group has helped tremendously, he said. Susan Nicholas, an academic mentor for FASTrack, who is also a Collegiate Recovery Community volunteer, said Clayton is one of the hardest working students she’s ever known. She sees a bright future for Clayton. Clayton has been a natural leader and mentor for younger students in the group, said Beth Spencer, a lecturer in English and the CRC faculty adviser. Spencer said he’s also one of the hardest workers she’s ever met. For the past three years, Clayton has also helped others reclaim their lives as a staff member at Oxford Treatment Center, a private addiction treatment provider in northeastern Lafayette County. He has worked as a weekend counselor for its sober living program while completing his internship during the week at its Oxford Outpatient Office. His work has included facilitating a weekly aftercare group that supports those in their first two years after treatment. “Ricky’s dedication is inspiring to all of us,” said Lisa Hillhouse, a clinical therapist at the center who supervised Clayton through his internship there. Clayton’s two grown sons and his grandchild will be among those cheering him on at Commencement. Restoring relationships with his family has been an important priority during his recovery. He is also focused on pursuing a master’s degree in social work. He urges those who are struggling with addiction to seek professional help to get sober, and also to lean on the support of a recovery community while they pursue their dreams.